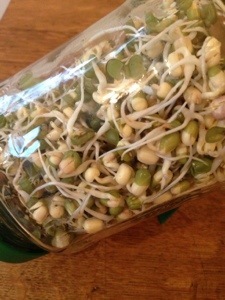 This recipe uses the Jar of mung beans I sprouted last week. 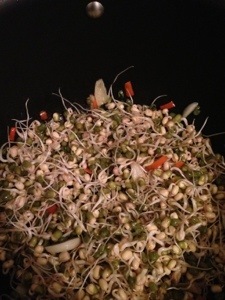 To sprout beans (buy a bag in an Asian supermarket where they are cheaper than health stores). Use a large jam jar rinsed with boiling water. Rinse 3 tbsp of beans add to jar and fill jar with cold water. Leave to soak in a dark place overnight. Drain water and rinse. Place jar on it’s side and put back in dark place. An airing cupboard is ideal. Rinse daily until sprouted. These are a great addition to sandwiches and salads also. Place 2 tbsp of coconut oil in pan and add ginger, garlic and chilli. Fry for 2 mins. Add the sprouts and cover with water I used approx 2 litres. Add turmeric. Bring to the boil and simmer gently. 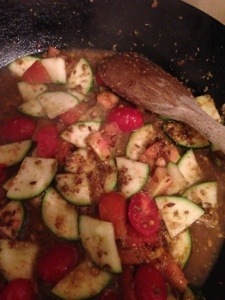 In a frying pan add 1 tbsp coconut oil and brown cumin seeds, add coriander powder immediately and stir. Add chopped vegetables and cook for 3-4 mins. 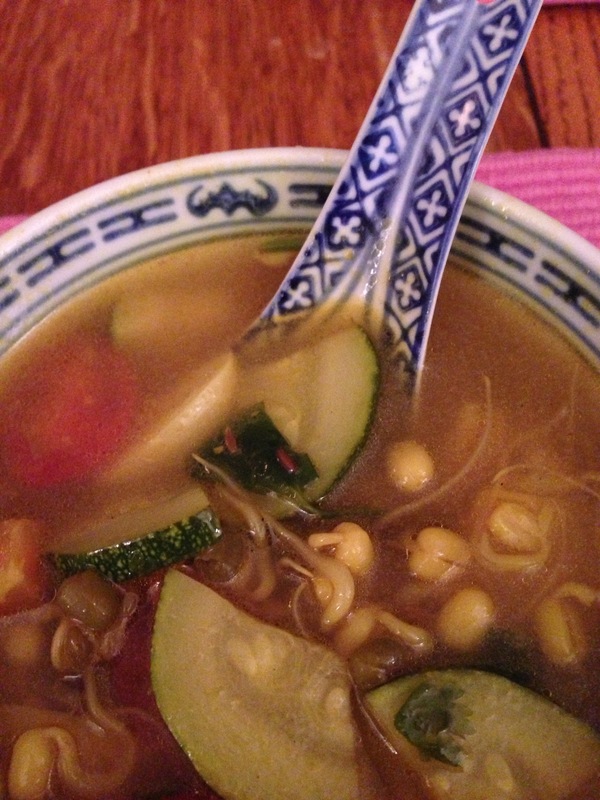 Add the spice and veg mix to the soup and season to taste. Add 2 tbsp chopped coriander at the end just before serving.